The charity Cool Earth has earned the loyal support of Grande Dame Vivienne Westwood, who has designed an exclusive range of T-shirts for women, men and children. At just £25 for adults and £15 for kids they’re a great stocking filler for fashion loving friends and family. Proceeds go directly towards Cool Earth’s work with the Ashaninka tribe in Peru to protect at-risk rainforest. 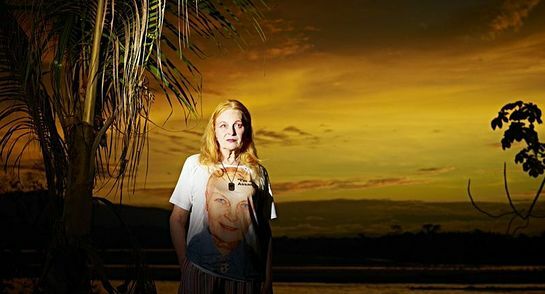 “If we don’t save the rainforest, we’re all history,” said Vivienne Westwood. “I’ve focused on this amazing charity called Cool Earth – it’s our only hope”. The shirts are available here. You can also sponsor an endangered tree or whole acres of rainforest in the name of your loved-one. Beautiful personalised certificates of sponsorship are perfect for slipping in a Christmas card or popping in a stocking. If you need a last minute gift you can email the certificate too. £6 saves a mahogany tree. £30 saves half an acre of rainforest. Cool Earth is the charity that works alongside indigenous villages to halt rainforest destruction. Supporters include Dame Vivienne Westwood, Georgia May Jagger, Kate Moss, Sir David Attenborough and Ricky Gervais. The charity is now protecting half a million acres of rainforest that would otherwise have been destroyed across the Amazon, Congo Basin and Papua New Guinea. This is equivalent to 1,428 Hyde Parks or 35 Manhattans and is keeping 120 million trees standing. Vivienne Westwood -- Get Your Feet Wet!